"I wanted to find a way to make beef brisket that wasn't a BBQ recipe but wasn't just plain beef either. This is what I came up with and my family LOVED it." Season the beef brisket with salt and pepper and place into a shallow baking dish or large resealable bag. Combine the Merlot and balsamic vinegar; pour in with the steak. Seal or cover, and marinate in the refrigerator for at least 2 hours. Arrange onion rings in the bottom of a roasting pan. Season with garlic, thyme, and rosemary. Pour the marinade into the bottom of the pan along with the beef stock and stewed tomatoes, and lay the roast on top of the onions so they form a roasting rack. Cover tightly with a lid or aluminum foil. Bake for 3 hours in the preheated oven, then peel back the aluminum foil and add carrots and celery to the pan. Cover again and continue roasting for an addition 1 to 2 hours, or until the brisket can be pulled apart with a fork. It worked great--I skipped marinating it and just tossed all the ingredients into a slow cooker for 6 hours on high (or even 7). Delicious! This was very good! I did it in the crock pot and we loved it. I'll be sad when the leftovers are gone! My whole family enjoyed this with mashed potatoes. I threw in a few extra carrots because we just love them. Thanks for the recipe!! A knock-out! My family gobbled this up like there was no tomorrow, and they're not big beef eaters! 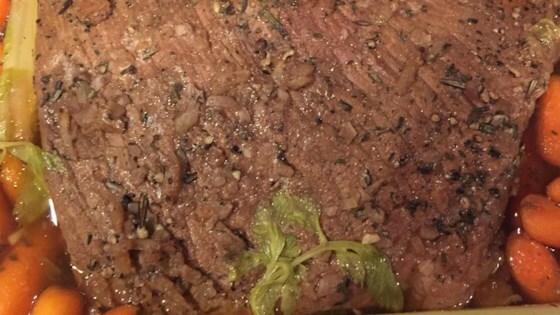 My husband and I both loved it, and it was really easy to prepare (at least, the crockpot way...) The meat just fell apart with a fork, and tasted really, really good. Thanks!